Katie Musolff and Lynne Railsback are two watercolor painters who depict the natural world in delicate and intricate detail. Musolff’s paintings of butterflies, birds, bugs, and other creatures have an Audubon-esque quality. 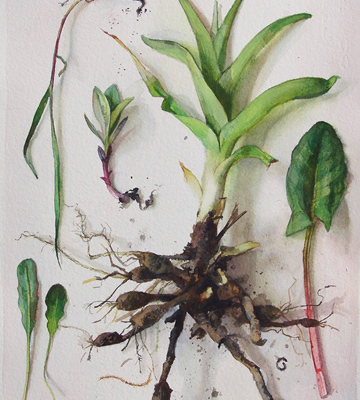 Railsback approaches her work with a botanist’s eye, creating a colorful canon of paintings of flowers, leaves, roots, and branches. This exhibition celebrates the organic world with precision and beauty.